In its opening week, trade-only AV specialist PSCo welcomed over 50 visitors through its doors, giving them a first look at the unique enhancements made to its acclaimed Assessment Centre in Reading – the only place in the UK where the most innovative technologies can be viewed and tested all under one roof. 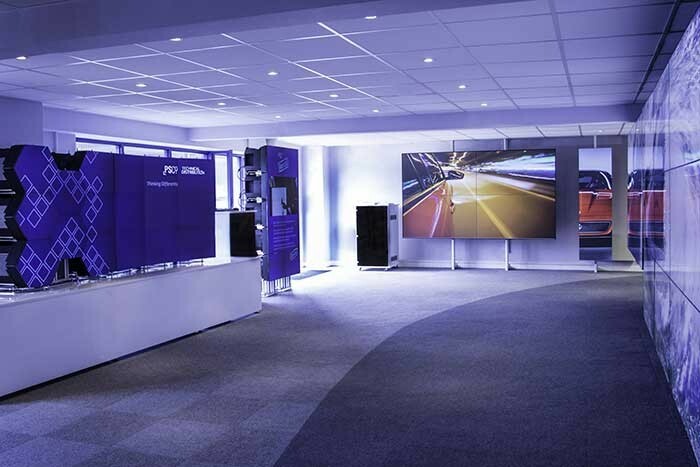 The largest selection of large format and videowall technologies are now on show from leading manufacturers including Panasonic, NEC, Samsung, Sharp and PSCo’s own Exclusives range. "We took a leap of faith in October 2012 when we opened the Assessment Centre as it was an industry first," said Stuart Holmes, CEO of PSCo. "Since then, we’ve spent a lot of time listening to our channel partners and customers and we’ve created this unique offering to enable the selection of the right products and solutions for each individual project. At PSCo, we combine our technical knowledge with a consultative sales approach and are confident this, along with our hand-picked technologies, will provide our customers with the invaluable assistance needed to always get it right and make every project a success." The official re-launch of the Assessment Centre has attracted visitors from many different sectors, including rental, broadcast, corporate, retail and public sector. Word is spreading as more people see and experience the centre for themselves. Not only can they compare products side-by-side, but they can also test out different configurations and technologies. Being able to run through multiple scenarios, set-ups and products to see how they work together and perform in real-life situations is highly beneficial and avoids expensive hold ups that can happen if testing is conducted on-site. "Many thanks for inviting me over to view the newly updated Assessment Centre," said Barry Thurston, chairman, Beaver Group. "It was well worth the effort and I was both impressed and informed. At Beaver Group we are witnessing a growing requirement for large format displays which is often accompanied with customer confusion as to which approach is best. We will certainly be inviting those customers to join us at the centre so they can see first-hand all the options open to them. Many thanks for the additional resource, we shall certainly be making use of it." Rupert Snape, Commercial AV account manager at Sharp, said: "The PSCo Assessment Centre re-launch was a great opportunity for Sharp to demonstrate our large format touch screen technology to several high level potential new customers. It was also an ideal forum for guests to benchmark our new 90" display and high bright 60" videowalls against other manufacturers’ products in this field." Stuart Holmes continued: "We’re constantly working alongside manufacturers and their roadmaps to make sure we have the latest generation of products on show, and raising the bar in terms of technical knowledge. At PSCo we pride ourselves on our complete understanding of what works well together and ability to create a complete package solution for successful installations in any situation." In picture: PSCo provides invaluable technical assistance to customers ensuring every project is a success.